This is a post that have a hist dated back to my exchange study last year in Princeton University. 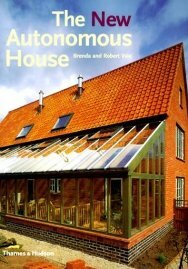 I was attending a course about sustainable building design and I was asked to read a book “The new autonomous House” by Brenda and Robert Yale. Which I got to know this house. I have bought the book and completely read through it in a few days and then produced some drawings together with another student Maria Huerta. 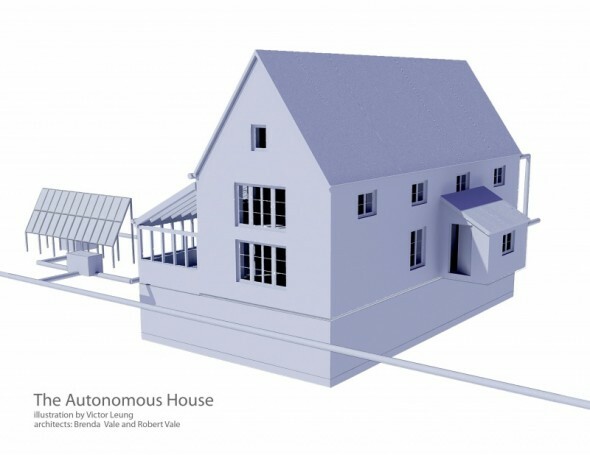 During my exchange period in Princeton University, I have done a comprehensive study on a house that is autonomous from the site. The house was designed and built by Brenda and Robert Yale in British Midlands. 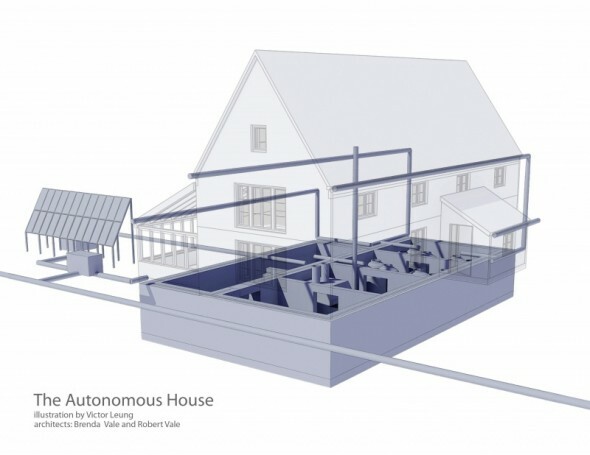 They named it “The Autonomous House”. I have read through the book they have published about the house. 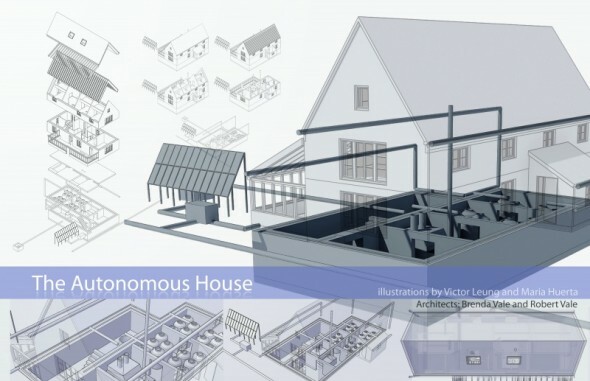 The book is called “The new autonomous house” which have got a lot of praise from various practice that research on green architecture. The book records their building based on the principles of sustainable consumption of the site resources. They have created a remarkable example to demonstrate the feasibility of creating such a house that is off grid for energy, water and waste. This is particular difficult considering their small plot size which locates in a suburb context. 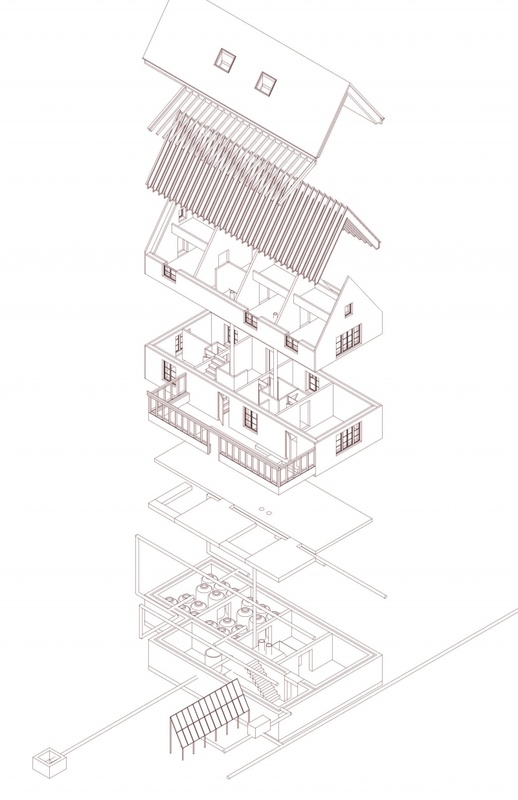 They have created a four-bedroom house that was neither exotic in appearance nor difficult to maintain. In this short report I’ll only focus how they achieve the high degree of energy efficiency by the design of the external wall, mainly by careful calculation of heat production, heat lost and energy consumption. The construction is mainly focused on super insulation of the building envelope and all openings, heat exchanger for ventilation, thermo-storage with high density building materials and the use of solar heat gain. The design philosophy leads the design of the building by emphasizing much on the thermal insulation. Located on a cold climate in the British islands, the house is constantly facing a need for heating requirement. Which is the main cause of energy consumption for buildings in that area. Calculation is done for unavoidable items such as lighting and cooking are put down and add together with other heat production objects such as human beings present in the house. An ideal temperature is set for the well being or comfort and that creates a ideal energy lost value. The detailing of the wall is than decided based on these numbers. They have created a 450mm thick cavity wall which has 300 mm cellulose insulation in between two layers of bricks. All windows are triple glazed with high insulation detailing. The roof have an even thicker insulation of 450mm cellulose. The thermal transfer value combined for the external walls (0.14W/m2) have reached a very low level when compared to un-insulated design. Such insulation can help trap heat within the house and allow the interior to remain warm without the need of excessive heating. 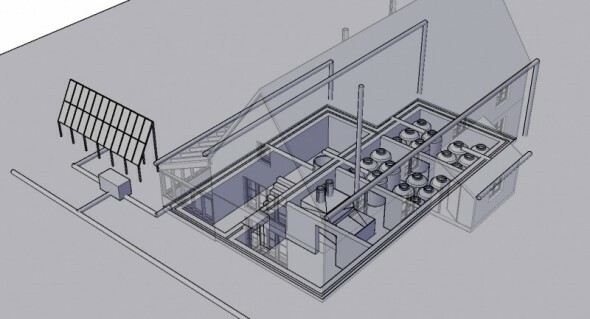 The house applied various heat exchanger which are only turned on based on the room occupancy. This heat exchanger means that there is no need for opening the window to allow fresh air circulation. For fresh air to enter the house, it goes through the heat exchanger which control the amount of air flow for the specific requirement, to avoid excessive heat lost with the exchange of air. A high percentage of heat in the air that leaves the room is extracted to the fresh air that enters the room. 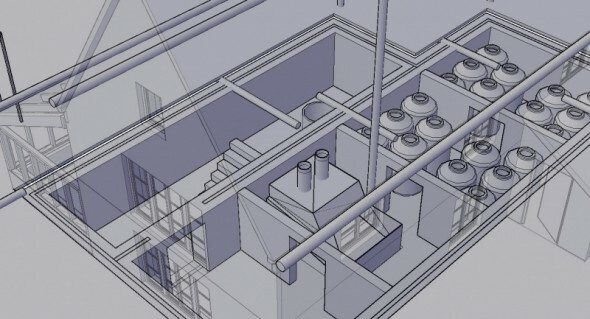 The electricity energy used to operate the exchangers are much less than cost of using conventional means of air exchange with a heater. That result in a high efficiency for energy consumption. Some windows are also designed as non-openable windows due to its lower thermal transfer value in the frame than openable windows. All glazing have attained a U-value average of 0.85W/m2. 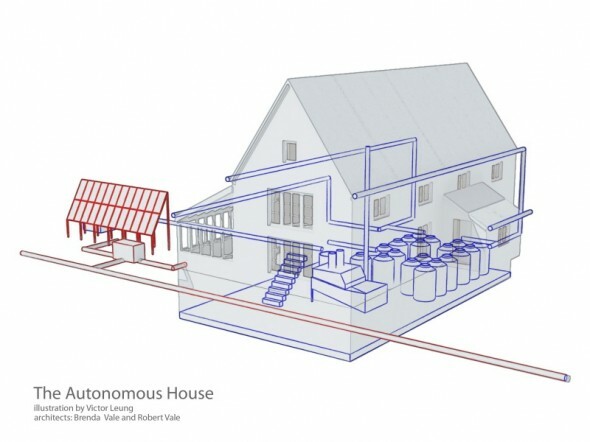 By designing the house to trap solar energy and store it in a high density material, the house is able to capture a lot of solar heat during the day time and store it for the use during the night. 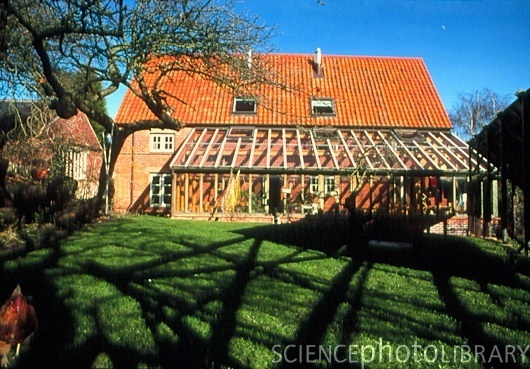 A conservatory is designed on the South side of the building to receive maximum amount of solar exposure through its glazed constructed. The glass is still triple glazed which allows solar radiation to enter while preventing the warm air to lose heat through conduction through the glass. 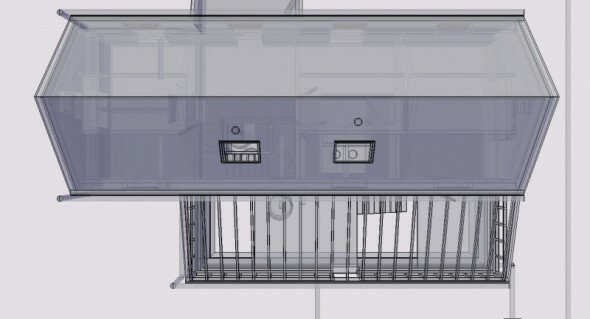 The heat are stored on the five structural bays that is designed to perform this function. The bays are constructed out of concrete blocks which is 150mm thick. All five walls created a volume of dense mass that has a high heat capacity. The water header tank is stored in the interior volume at the attic also acts as a heat reservoir. These elements emits heat during the night time to warm the house. Solar water heater are used to heat water used for bathing, they have installed such a water heater that can operate either by the solar radiation of the sun or by heat exchange methods. Statistics have proved that most of the time during the year, solar energy alone is sufficient to sustain a normal showing time. They have also looked into the duration of a shower and the flow of the shower head to optimize the use of water, and thus the energy used to heat up them. They have installed photovoltaic panels for the collection of electricity, however due to practical consideration, they did not use the method of storing the electricity with batteries because of the low efficiency. They instead cooperated with the grid company to use a inverter that allows them to sell the excessive electricity during their low demand and buy the electricity when there is no sun. After one year of occupancy, they proved that the PVs have produced sufficient electricity that they do not need to pay any electricity bills. This building may be an ideal example in the Western suburbs, but how will the knowledge be applicable in Hong Kong. I believe that even though Hong Kong located in a warm zone, the idea of highly insulated building approach still applies to the buildings in Hong Kong. For example office building that are only occupied during daytime are usually suffering from excessive heat gain. The common glass curtain wall design of most commercial buildings in Hong Kong have a lot of potential to be improved by using more advanced insulated materials. Low-e coating, tinted glass and triple glazing are perhaps the easiest way to increase the insulation value. Large companies that performs curtain wall or glass consultancy offers choices that balance out the insulation with acceptable aesthetic result. It is widely accepted that Hong Kong residences are very likely to use air conditioning during the night time to cool the interior in the summer. By increasing the insulation value of the building, it is beneficial for reducing cooling demand at the cost of loosing square footage. I believe it is the government’s responsibility to encourage the industry to adopt these environmental friendly means of construction by passing laws that promote such design. It could be a compensation by plot ratio for the developers that incorporates insulation that results in the loss of square footage.